What drew me to these boxes yesterday is my own crazy hoarding issues, which is totally OCD, I know. I have a few shadow boxes that I've never touched, but have felt somewhat guilty over saving. They've been tucked away in tissue paper for a few years now. Maybe it would be a fun December project to stop saving them and put them to good use, huh? They are in modern uncomplicated wood frames, just like the birdy box shown above, with a white interior and a creamy burlap background. A little magnet keeps them closed. I have two. I just have to come up with a clever showpiece. That's where I'm stuck. 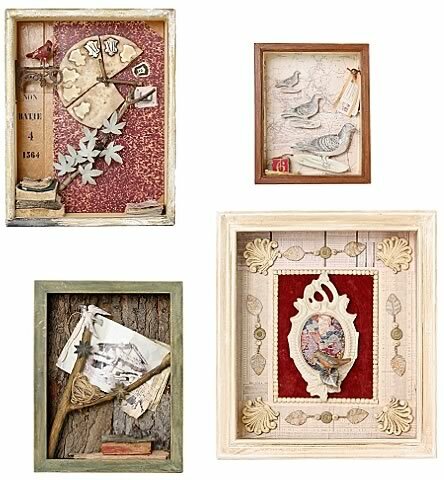 What would you put inside a shadow box? I'm leaning away from the traditional (ticket stubs, photos, lace, velvet ribbon) and considering a simple tree branch with a handmade paper bird resting on it. A branch created with pretty wrapping paper or a brightly colored blue road map, something like the Real Simple sections that Happy Mundane wrote about a few months back. (I loved that post, Jon!) Or maybe steer away totally from the map idea and go with something more personal, like a 3-D diary of sorts but that may clutter the box too much and I'd like to keep it simple. Maybe I could take 12 of my favorite little badges or pocket mirrors in bright colors and in a perfectly neat grid, pin or super glue them inside. TIP: Go learn about the history of the shadow box. A fun read indeed! Have any clever shadow box ideas? Have you ever used one in your decor?